We measure a successful project in three distinct ways. First, when the client is happy and completely satisfied. They are thrilled with their finished office Aura and didn’t experience the headaches and stress normally associated with a construction project. Second, when the office is completed on-time so the client can take advantage of the tenant fixturing free rent period. Finally, when the project is completed on budget. Aura’s construction process is at the heart and soul of our company’s success. Our construction process is fixated on risk mitigation. In fact, the way we are fundamentally organized and manage our projects is designed to mitigate risk. Aura Office Environments is a Design, Build, and Furnish company. We manage the end-to-end process of building your office. That’s everything from design, permitting, building, and furnishing. 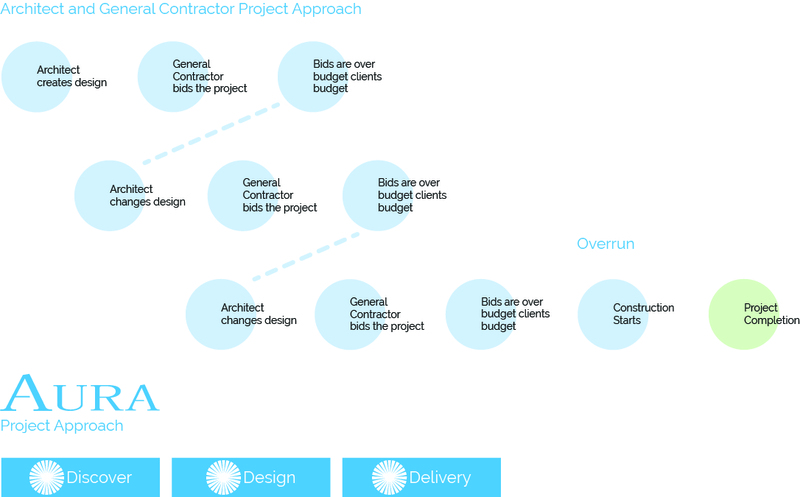 Conversely, the Design-Bid-Build process is quite different. You have to hire the architect, construction, and interior design firms. You have to secure permits and worry about all the other project management details. The way we operate actually prevents you from taking on risks that you don’t have to and don’t have the time for. For example, look at the two figures below. 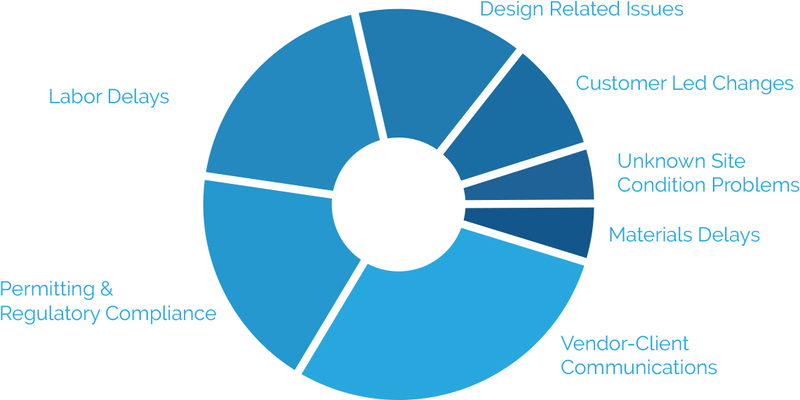 The figure on the left shows the number of vendors and contractors you would have to interface with, manage and audit when using a Design-Bid-Build approach versus working with Aura Office Environments. While risk is inherent with every construction project, the Design-Bid-Build approach actually creates more risk. Whenever there are more vendors to manage, there are more communication related problems and schedule-related complexities that result in delays. Design related issues increase because the designers and builders work for separate firms, not within the same building. The pie chart below shows the various causes for Design-Bid-Build office construction projects being late or over budget. Let’s say you’ve hired an architect to design your new office who has general contractors bid on their design. Unfortunately, the bids are more than the allocated budget so the design has to be modified. However, you liked the original design and want to retain the design elements. This causes the architect to redesign again and the contractors to rebid again which results in schedule delays, increased likelihood of mistakes, and likely cost overruns. This iterative process continues into the construction phase as well as unforeseen changes are needed to be made. The benefit of working with Aura is shown in the below. At Aura Office Environments, our design and construction teams are deeply intertwined and constantly engaged at every step of your project beginning with the initial discovery. The process from discovery to design to build is smooth and occurs without unwanted delays and cost overruns. We are consumed with minimizing risk during the construction process. That’s why it has to be tightly integrated with the design process. We know you want information about how your project is progressing and we ensure it happens in-person, online, predictably, and continuously. Aura ensures that you are never have to track someone down to find answers. Rather, our proactive approach to communication means that every project team member on your team is not only talking to each other, but are also, listening to you through every step of the design-build process. Through our online client dashboard, you can access your project schedule, drawings, project updates, photos and financial information updated on a daily basis. There’s an art and science associated with project scheduling. Without the right experience, your schedule will be overly optimistic and not applicable in reality. Conversely, unforeseen random circumstances can pop up at any time. In order to hit your deadline and ensure you are able to experience your Aura at the moment it was planned, we create a schedule that is based on a carefully considered plan after all the factors of your project have been evaluated. Then we apply the right level of granularity of actions and the proper pace of progress so your high expectations are absolutely met. You’ve fought hard to secure the right budget to create a new office that everyone can be proud of. We realize that unexpected budget increases can cause roadblocks. We know number one cause of cost overruns can be traced back to the lack of project management experience. That’s why we conduct multiple levels of oversight to ensure we’re managing project changes, scope creep, and resource coordination. We also want you to know exactly what you’re paying for… we’re in a partnership so we’ll be honest and open with you. We’d like to share something profound with you that we’ve discovered over the last three decades. The quality of employees will typically reflect the quality of the company and services it provide. We think this is important because we’re a 3rd generation family owned company (when you meet with us you’ll quickly realize that most of us are related or share the same last name). The concept of “quality” is predicated on the belief that the lasting impression you make is the most important one. We’ve been around for generations and will always act in the best interests of our clients and honor our history. Our safety-first philosophy is the high standard we set to keep our customers and employees safe at all of our jobsites. We conduct safety meetings throughout the year for our employees, as well as jobsite audits to ensure that our strict safety standard is met. We comply with all federal, state, and local laws and regulations. We truly believe in partnering with our clients. Our motivation is to work together, never shirk from responsibility, and always finding the right solution as opposed to an excuse. We believe we are the same team, working toward the same goal—creating an incredible Aura that your employees, clients, investors, and you are proud of. 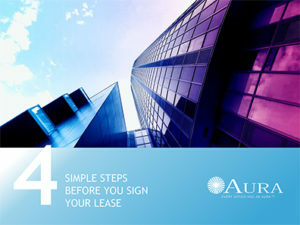 Discover 4 Simple Steps to Follow Before Signing Your Office Lease with this complimentary guide.